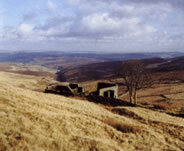 This novel, Wuthering Heights, has haunted many of us for more years than we care to remember, it has been filmed a number of times, with varied success, but time and again the road leads us back to the West Yorkshire Moors, to Haworth, to Top Withens, the ghosts of Cathy and Heathcliffe walk here, their haunting cries travel upon the winds that blow across the moors, the winds that blow across time, calling us , calling us back, calling us on and we are, time and time again drawn back into the novel. Is this what Emily Bronte intended? We will never rightly know. What we do know is that we are captured just as soon as we open the pages and are held, from the first word to the last. Here we will present a complete e-text of the novel and we hope that this will encourage you to out and purchase the book, the edition recommended and illustrated on the right hand side, is published by Penguin Classics, we'll also, as usual, provide some well chosen and related links. Right below we have provided the lyrics to 'My Immortal' written and recorded by the American group Evanescence. We first heard this song and Wuthering Heights was invoked. Thus it shall be, thus it is, for all time.